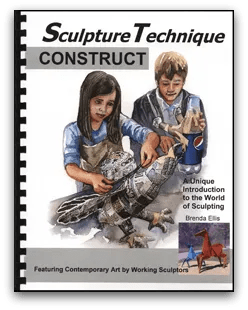 I am thrilled to be able to introduce you to Sculpture Technique: Construct from ARTistic Pursuits! We have spent time in the Middle and High School books for the past 4 years – so you might imagine how thrilled I was to learn about two more books for upper elementary to high school – Construct and Model. We were chosen to use Construct. This book is quite different than the rest of the line. It is a non consumable workbook, which means you may use it year after year. The book has 4 units – Papermaking, Cardboard, Paper-Mache, and Wire. 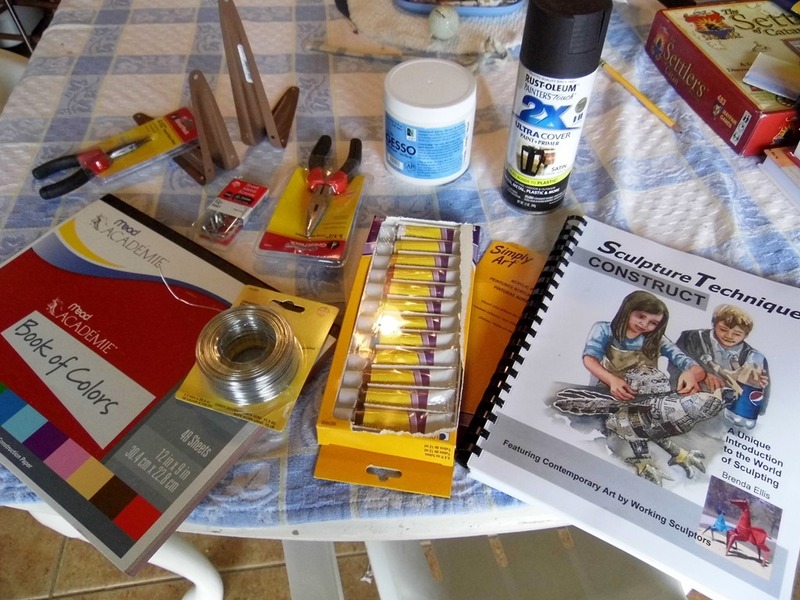 I was able to look through the Art Supply list and collect the items from our small town. We looked through each of the 4 units in detail as a family and settled for the 3D Paper Mache with Form. I really wanted to make the Papermaking and molding, but we are in our most wet time of year – and I wasn’t sure how the paper would dry. 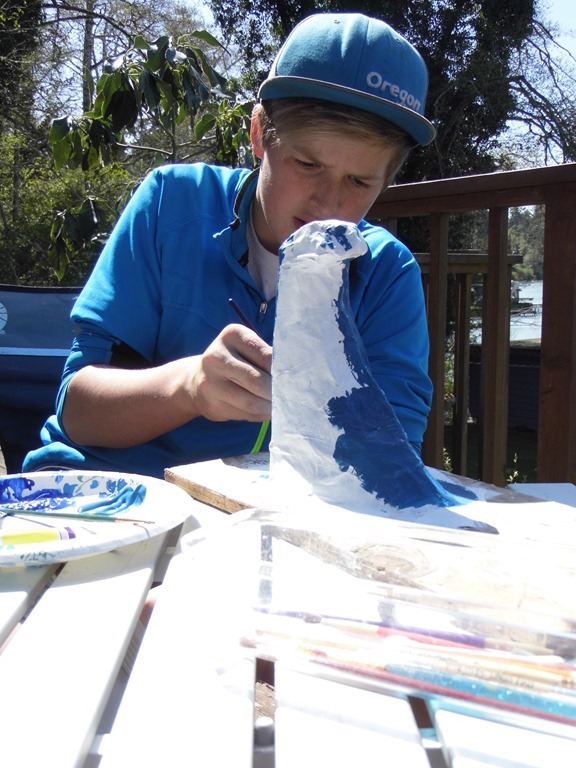 In the ARTistic Pursuits way – we learn all about the art form. For paper molding we learn about the 3D shaping of an object and how it is formed. We look at a master’s piece, in this case the Red and Blue Pony by Kevin Box – which is a 4.5’ x 6’ sculpture that looks like folded paper. The supplies and instructions are very clear and simple to follow with great photographs to guide. Once you learn about paper molding, there are project ideas. The project gives inspiration of something to mold, and then has step by step instructions for creating. 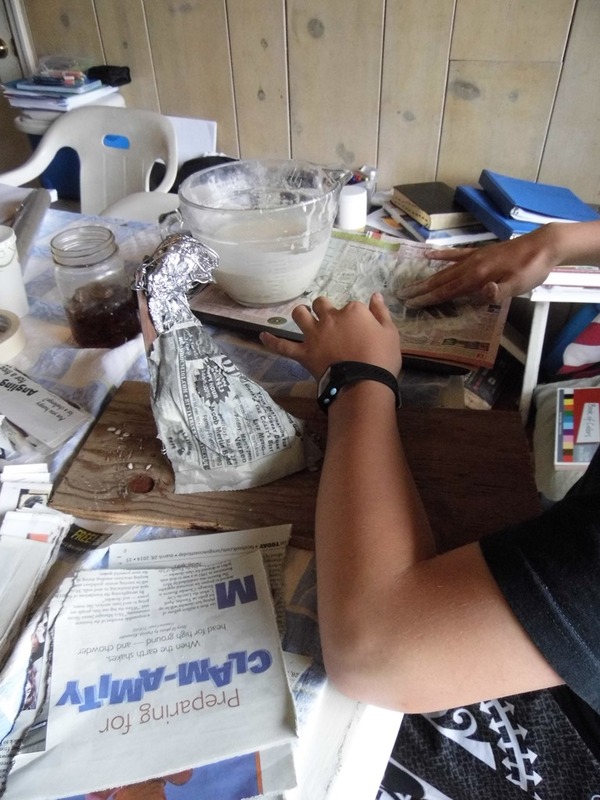 There are 4 projects to use with the Creating Form in Papermaking Unit. By the time a student goes through all four projects, they should have a clear understanding of how it is used and how versatile the wet paper can be. We skipped the Creating Planes in Cardboard unit. If you have a child who is interested in Landscaping, Architecture, enjoys structure and shapes, this Unit might appeal to them. When I worked for an Engineering and Architecture firm, we saw models like the ones in these units presented often for our projects. There are 3 projects in this unit – Explore Relationships of Planes, From Planes to Forms, and Construct an Architectural Model. We started with Unit 1 Project 3, Wet Paper Construction. 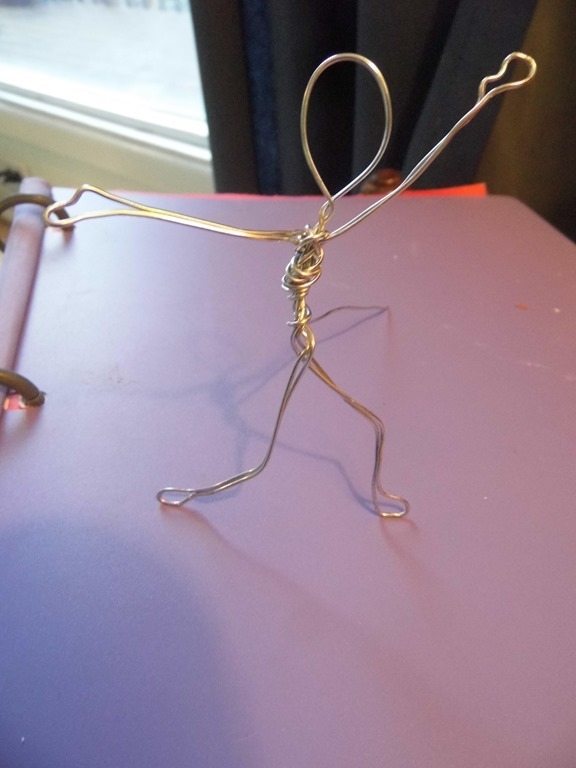 We used this project to teach us how to mold the wire into people. The instructions are broken down into bits. The measurements and descriptive words helps to guide the artist well. Simply doing exactly what the text says created a replica of the person. 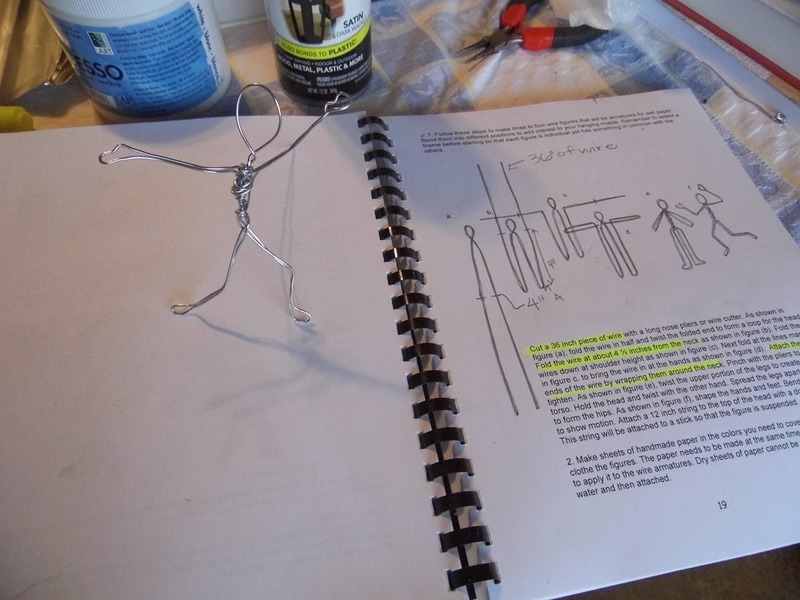 This is similar to their other books, where you are learning HOW to recreate art, it is less of free art time with wire and paper, but rather detailed instructions for how to form the wire and paper. 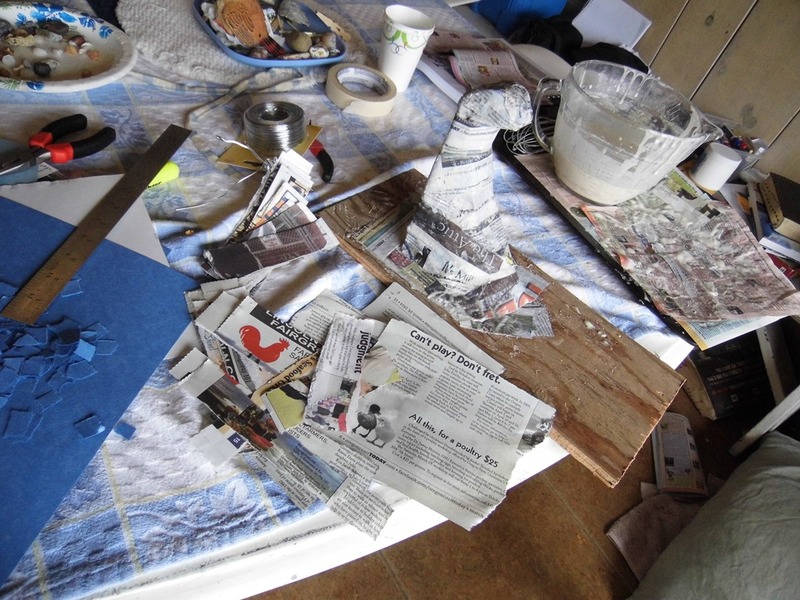 While I was gone, Jon got all of the supplies out to work on Project 9 – Papier-Mache Construction and Balance. He got to work creating a base. The project idea is a flying monkey on a stack of corn, and he saw Surfer jumping off of a Wave. This project appealed to him because of the initial construction. I purchased screws, nuts, washers and bolts, but he went with nails first. Next he used the wire and objects around the house to form the wave. 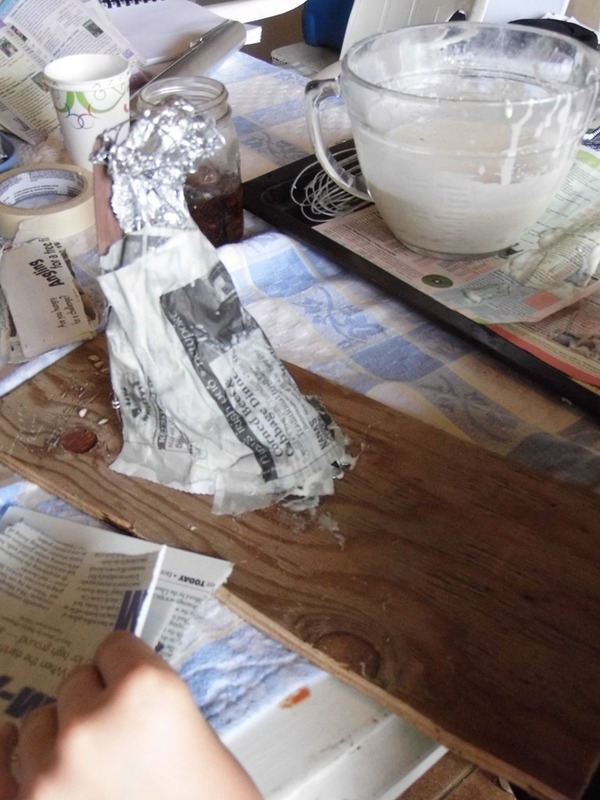 The next step was to cover with strips of paper and make the glue out of flour and water. We looked through earlier projects to get the recipe and instructions. This project dried quickly. We followed their instructions for how to apply the glue to the paper so that it wasn’t too thick. Again, I say We but I mean Jon. He was able to follow the directions and do all of the steps by himself. After a couple of days – it was really hard and ready to paint. He set himself up outside on a sunny day. 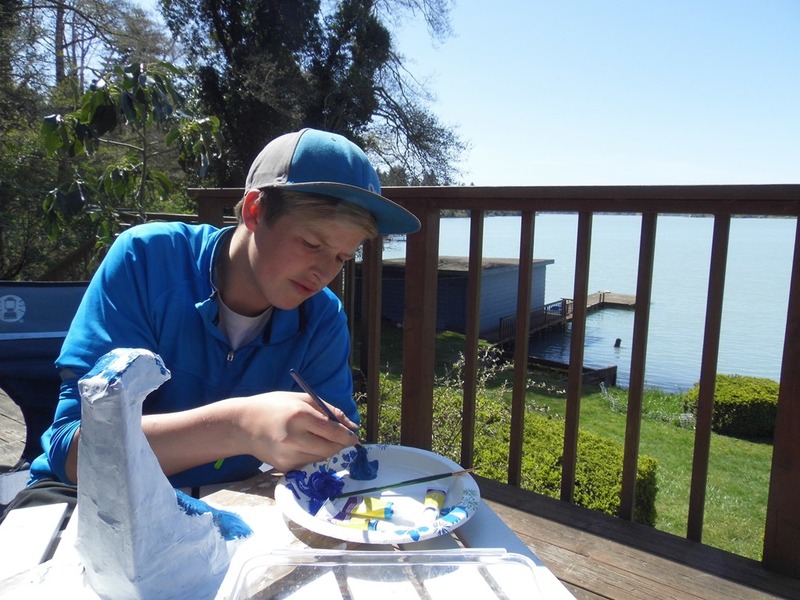 There are detailed painting instructions to guide the student as well, including how much paint to use with your brushes and how to clean up. Have I mentioned how hard it is to be a product reviewer and a homeschooler? Hard. Hard work. Whew! His finished product . . . no surfer. So, he forgot the balance part. 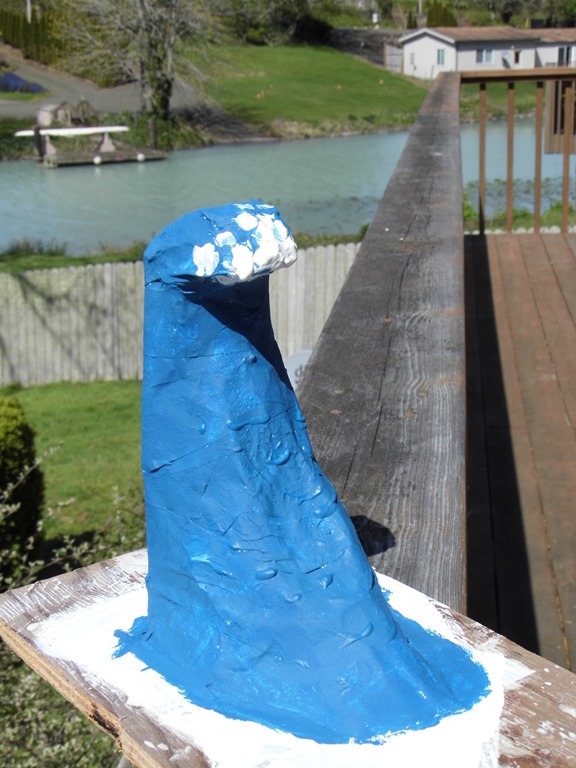 But he did get the papier-mache and 3d molding down. This is a solid Visual Arts Course. Jon is in Middle School – and in Oregon, we do not need to track credits for him. This can be 1 credit. If/When Nate takes the course it would depend on the amount of time he spends. 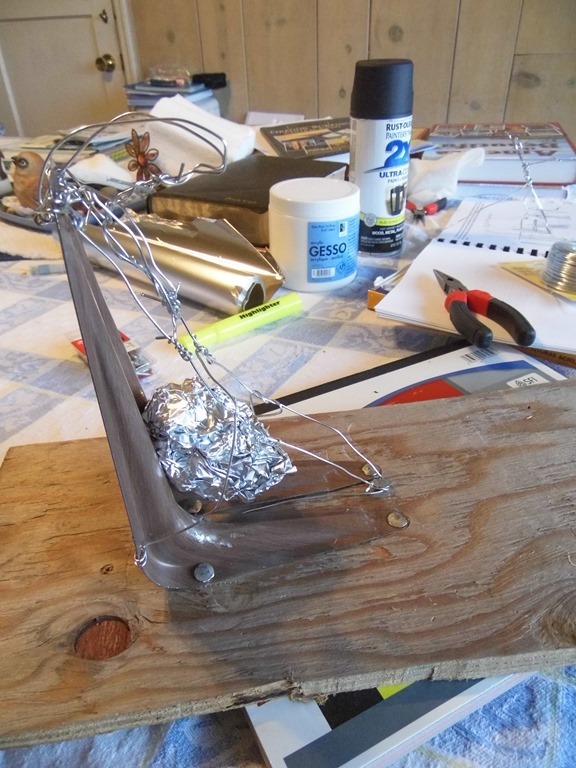 Here is the suggestion from the site: “Keep track of hours for planning and sketching, observing sculptures on trips to museums and parks, reading the text and additional reading and investigation, project time and any additional projects initiated by the student in media of papermaking, cardboard construction, papier–mâché, or wire. One thing you can do as the teacher is to take advantage of the Unit Evaluations. For Unit 4 – Understanding the Elements of Sculpture, Understanding Art and Craft and Understanding Craftsmanship. It asks questions like – What technical difficulties did you run into throughout the process of manipulating a roll of wire into a three dimensional sculpture? I’ve enjoyed the evaluations with ARTistic Pursuits. It helps the student think through the project. It also proves to the teacher and student if they really paid attention to it as Art, and not just arts and crafts. This book sells for $47.95 and is recommended for ages 11-18. 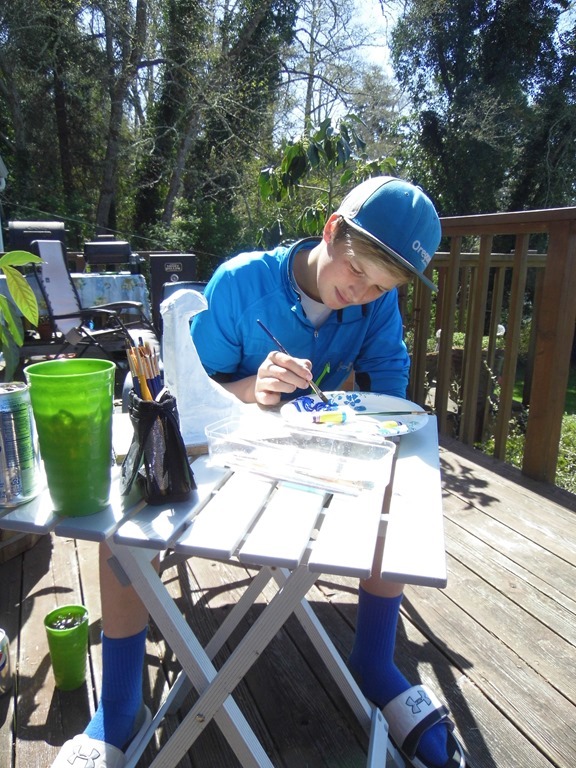 This entry was posted in Arts, Reviews, Schoolhouse Crew and tagged art curriculum, art program, homeschool art, HSBlogger, hsreview, program, sculpture. Bookmark the permalink. I love it!! So glad I got to see the finished product. Well done!